The African wilderness changes kids forever. It gives kids grounding and a love and understanding of nature that is hard for adults to grasp. Almost all conservationists who are fighting for the survival of nature and the word had spent time as kids in the wilderness. Tanzania leans itself to family safaris with a huge variety of interesting things to do besides sitting in a vehicle. Itineraries can be designed around any family’s needs. Would you like to be active with kids, exploring remote little nooks of the bush? Or would you and your troop like to take is easy and enjoy each other's company in a stylish lodge? Or would you like to experience a little bit of all of that? We can also incorporate all kind of activities in your safari, like canoeing, mountain biking, walking and cultural experiences. Day 1. Arrive in Tanzania and overnight in the lovely River trees Country Inn outside of Arusha. Day 2. Enjoy a full day game drive inside Arusha National Park with a morning’s easy walking, lunch in the forest and an afternoon canoeing safari. This will get you and the family right in the mood for what is to follow. Return to River trees for overnight. Day 3. Depart early in the morning for a transfer to Lake Manyara National Park. Enjoy a morning stroll or bike-ride through the local farming village of Mto Wa Mbu and have lunch in a banana plantation. Go in to Lake Manyara National Park in the afternoon and game drive to the remote south of the park to your campsite on the banks of the Endabash River. Here you will camp in our lightweight camp, the perfect way to spend your first night in the bush. Day 4. Enjoy a full day exploring the secret nooks of Lake Manyara and the forest. Send the evening back in the same camp. Day 5. Enjoy a morning game drive out of the park and continue to Plantation Lodge. With its big gardens and pool this is the perfect place to enjoy a lazy afternoon or go for a hike to elephant caves or a bike ride in the Crater highlands. Day 6. Full day game drive inside the Ngorongoro Crater. Return to Plantation Lodge for overnight. Day 7. Morning transfer and game drive over the Ngorongoro Crater and in to the Serengeti short grass plains. Spend the next few days in complete solitude in an area known as the Gol Mountains. Your camp will be next to an enormous boulder called Nasera Rock (great for climbing) and your tents will be the lightweight camp again. During this time of year this area will be filled with the migrating herds. Day 8. Spend the next two days walking and game viewing in the area around camp. This is also Masaai homeland and Masaai tribes men will join you on walks, this is a great time for some authentic cultural interactions. Day 9. Spend the next two days walking and game viewing in the area around camp. Day 10. Game drive to the Ndutu area where the bulk of the migration will be and enjoy this spectacle. Overnight in a small luxury camp called Olakira Camp. Day 11. Enjoy a full day game viewing in the Ndutu area and spend the evening back at Olakira Camp. Day 12. Board a morning scheduled flight from Ndutu either back to Arusha or to Zanzibar to enjoy a few days on the beach. PRICES ARE ON APPLICATION FOR THIS HOLIDAY. Pricing for this holiday are based on individual requiremets, season of travel, and availability of hotels selected. 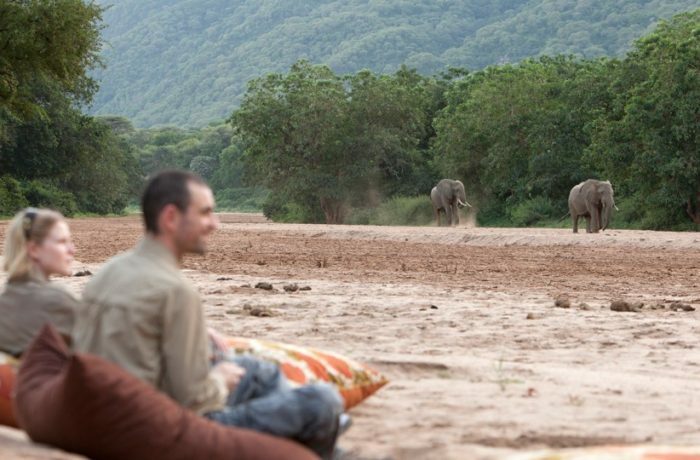 A Tanzania safari is a delight for all ages, and is an ideal family holiday. The excitement of the adventure is truly shared, allowing parents, grandparents and children to treasure memories for ever after.